TO: WormMail list ( recip. undisclosed) WormFax, liver fluke drench, another liver fluke pic, WormBoss News, FWEC Course, District Vets Conference Proceedings, Ecology of Voltaren?, diesel. (Many thanks to the NSW DPI Web Team (Craig Bratby), the NSW DPI State Vet Lab (notably Kathy Cooper and colleagues), and Veterinary Health Research, Armidale). Surprisingly there are still some WormTests with fairly high egg counts, despite very dry conditions over much of NSW. The latest issue of W/B News has hit the net (and a multitude of inboxes). If you have not yet subscribed, check out this latest issue of W/Boss News for expert, regionally relevant updates on what is happening worm-wise. April/May liver fluke drench done? A dry autumn is often the time you find clinical liver fluke disease (in addition to production losses). (Is ‘clinical disease’ a tautology?). By way of one-upmanship, having seen Jim Meckiff’s liver fluke photo, Armidale-based Senior District Veterinarian offered this one. (Attached, with permission. Please respect ownership of this image). (Thanks also to F Malan for his ‘nice’ pictures of livers). Yes, in the wikipedia article on same, check out the section on ecological effects. Very interesting. WRML. 1 pictorial follow-up to yesterday’s post on liver fluke. 2 Unexpected positives for liver fluke. Last Friday Armidale Sheep and Wool Officer Jim Meckiff was at Tamworth abattoir to see lambs from a prime lamb competition. 260 lambs about 7 months old from ~ 25 properties were slaughtered. ~20 lambs out of the 260 had ‘flukey’ livers. Jim was not in a position to ascertain from which or how many farms the ‘flukey’ lambs came. 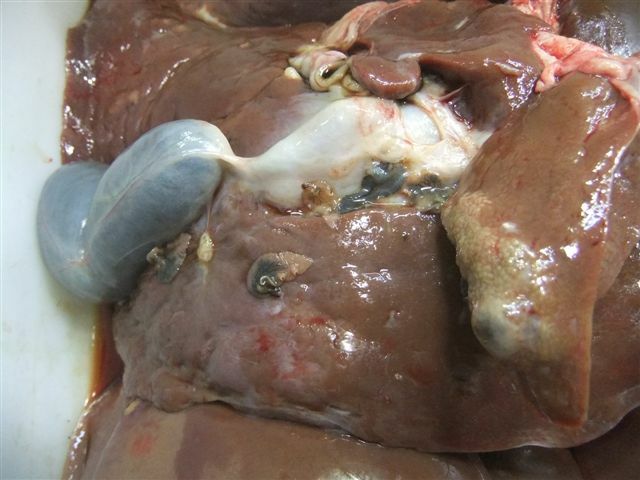 Despite the low-res image, you can see adult fluke on the surface of the liver which have escaped from bile ducts after the liver has been sliced open post-mortem. 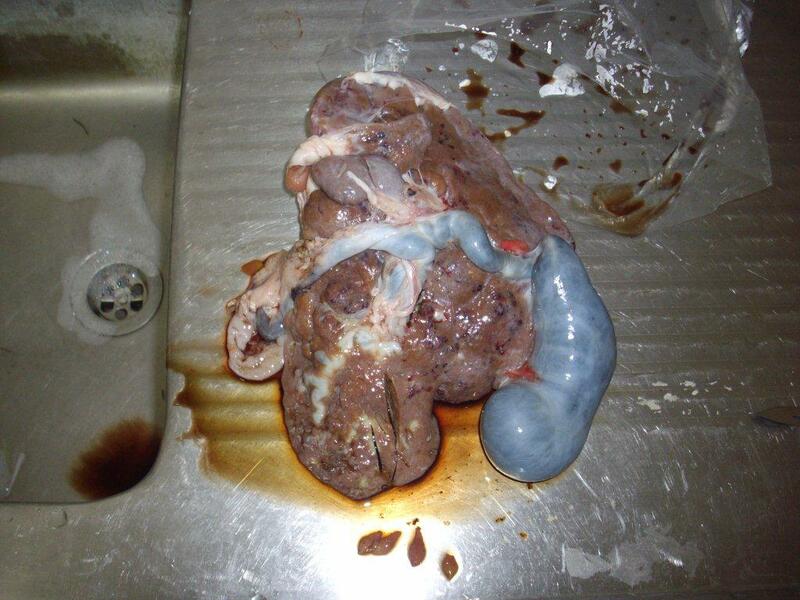 Quite possibly this liver contains fluke of varying ages: from immatures right through to adults. If you are not sure whether or not you have liver fluke, now is a good time to test (despite the dry conditions). Talk to your vet or other well-informed advisor about which test to use. Most labs (e.g. DPI, VHR) offer a liver fluke egg count. (This uses a different technique from roundworm egg counting, because liver fluke eggs are relatively dense and do not float in saturated NaCl (salt) solution). The NSW DPI lab, and possibly others offers a blood test which detects antibodies to liver fluke. ‘Some interesting information from Liz Braddon, Senior District Vet, Lachlan LHPA (based at Young). The ‘pools’ are blood samples that are pooled and tested at EMAI/the State Vet Lab (NSW DPI). * One property all pools >150 – Limousin cattle, mixed ages but good body condition and soft shiny coats – eg. no evidence of clinical disease! * One all negative (<30) "
Nik’s comment was that she was surprised that with this level of infestation, there were no visible signs of production loss. Belinda threw out the possibility that older cattle can develop immunity to a certain extent which minimises losses but obviously act then as a reservoir for the disease! ?- Eliz Braddon 9/5/13." Cattle, if not young cattle, tend to handle liver fluke better than small ruminants and alpacas. However, just as with roundworms, they can suffer significant if not obvious production losses (especially in high producing animals like lactating dairy cattle) in the absence of clinical disease. Clinical disease is the tip of the iceberg. For those of you who have liver fluke on your property, the single most important time to give a flukicide is now (late autumn/early winter). And while, for resistance management reasons, we suggest rotation between flukicides from different families (from drench to drench), the April/May drench is the time to trot out your most effective flukicide. Generally this means a flukicide based on triclabendazole. In cattle you also have the option of Nitromec(R) (Virbac). It’s very dry across much of NSW and many will be looking at hand-feeding sheep and other livestock. ‘Till now, one of the best sources of information in NSW on this subject, as with other aspects of livestock production, was your local NSW DPI livestock officer (LO) (sheep and wool officers, and beef cattle officers). However most of these positions are affected (will be deleted) under the current NSW DPI restructure. Some of the LOs will retire early (e.g. Chris Shands, Sheepo at Glen Innes), others may join Local Land Services, some will take up other positions in DPI (e.g. Ed Joshua (Dubbo), Trudie Atkinson (Trangie), Geoff Casburn (Wagga), or other organisations (e.g. Jane Kelly (Orange), who has gone to Charles Sturt University). Others may work as consultants/in the private sector (e.g. Geoff Duddy (Yanco), Doug Alcock (Cooma), Megan Rogers (Forbes), Sally Martin (Young). These are the ‘sheepos’ I know about. The picture for the beef cattle officers is similar to that for the ‘sheepos’. Fortunately the LOs as a group along with others have produced a lot of useful material to help you with livestock production, including feeding livestock. “There are very good resources on the internet to assist feeding inquiries and here is an old but still useful article on the topic”. (See attached doc). There are plenty of Managing Drought books at the store in Orange which is a useful guide to ruminant nutrition.” – EJ, Dubbo, 7 May 2013. Don’t ask me about feeding livestock. It’s not my area of expertise. By the way, dry autumns are often one of the times that livestock come down with liver fluke disease. Keep that in your list of “differential diagnoses”. An inquiry from a colleague (Kylie G) today prompted me to republish a link to a document on Supply-by-veterinarians-of-repackaged-drenches-for-large-animals in NSW. Having done that, small land-holders in particular face the issue of possibly being only able to get the right drench in a large drum (which they might use in a decade or so, somewhat beyond the shelf-life). Probably for economic reasons, drench companies are reluctant to provide all their products in small as well as larger quantities. An alternative may be for private vets – if they are willing of course – to dispense smaller quantities, following various rules (as outlined in the document at the end of the URL/link below). I know of at least one South Coast (NSW) practice who happily and proactively does this. Prompted by the lead this vet practice took, I encouraged my colleague Dr Lee Cook (now retired from NSW DPI) to put the instructions for this into writing. Yep, yet again there is a link to WormBoss in this email. Why? Because the re-vamped WormBoss is a terrific resource for Australian sheep producers and their advisors. (And that’s an understatement). WRML. Want to get the equivalent of a $5.20 price rise/head of sheep? Surely you are all by now subscribed to the Monthly WormBoss News. If not, consider the great information you are missing out on. Want to get the equivalent of a $5.20 price rise/head? Here’s how. Think about issues like the weather and prices for sheep and wool. It’s natural to think this way but there’s not much we can do to influence these factors: so why do we do it? Now if you want to remove all those outside issues and concentrate on controllable issues – (feeling better already?) – one of the big issues is worm control. Some benchmarking groups have shown that the differences between most and least profitable sheep businesses has almost nothing to do with differences in prices received. It’s mostly to do with on-farm productivity, in other words producing more commodity and in so doing reducing the cost per unit of that commodity. Worms are a major reason for low productivity, either through deaths or production loss. Sheep produce less wool, meat and lambs from what they consume at pasture when they have worms. Worms make sheep less efficient and sheep death has a big impact on efficiency. In a trial conducted over two years*, on six farms with 1440 Merino ewes in the New England region of NSW, good worm control – using the WormBoss regional program – reduced the annual cost of worms by $5.20 per ewe. Let’s think about this in terms of efficiency and productivity. Traditional ways of managing worms meant a producer spent $2.00/ewe to control worms: mostly as drench but worms still reduced income by $11.00/ewe. The WormBoss regional program cost more, at $3.25/ewe to control worms (because of the cost of monitoring worm egg count and if drenches were effective) but worms only reduced income by $5.80: delivering the $5.20 advantage to WormBoss. Spending more on worm control meant the total cost of worms reduced, delivering improvements in efficiency and productivity. * PhD studies by Dr Gareth Kelly (Supervisors: Kahn and Walkden-Brown).